2 ¿Qué significa Preterito? 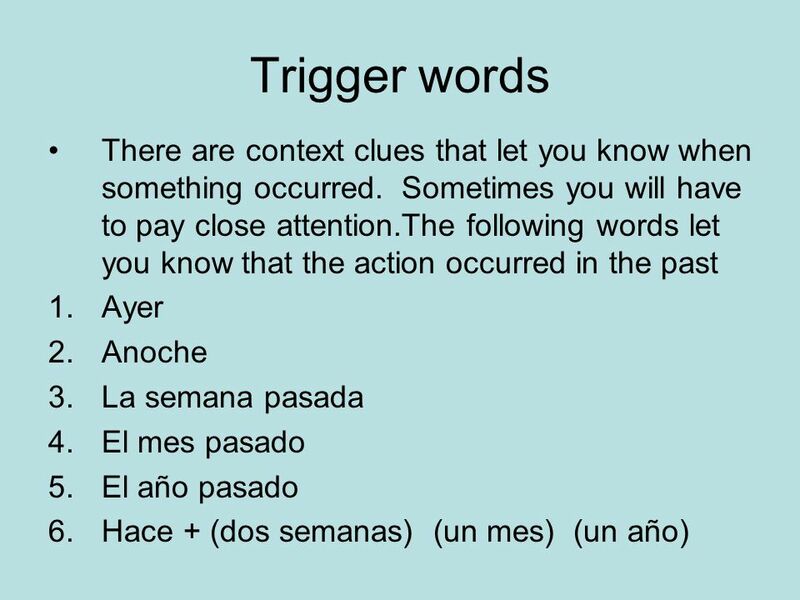 To talk about actions that were completed in the past, use the preterite tense. 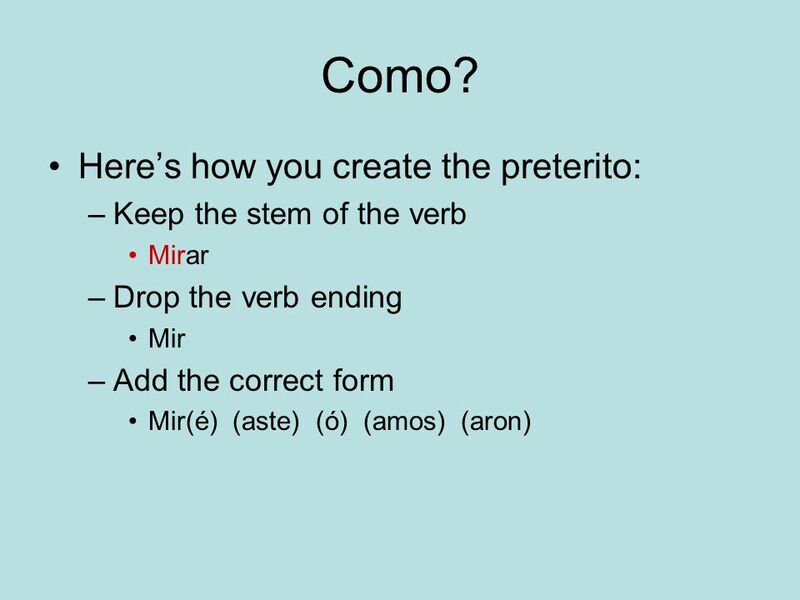 To form the preterite tense of a regular verb, add the preterite endings to the stem of the verb. 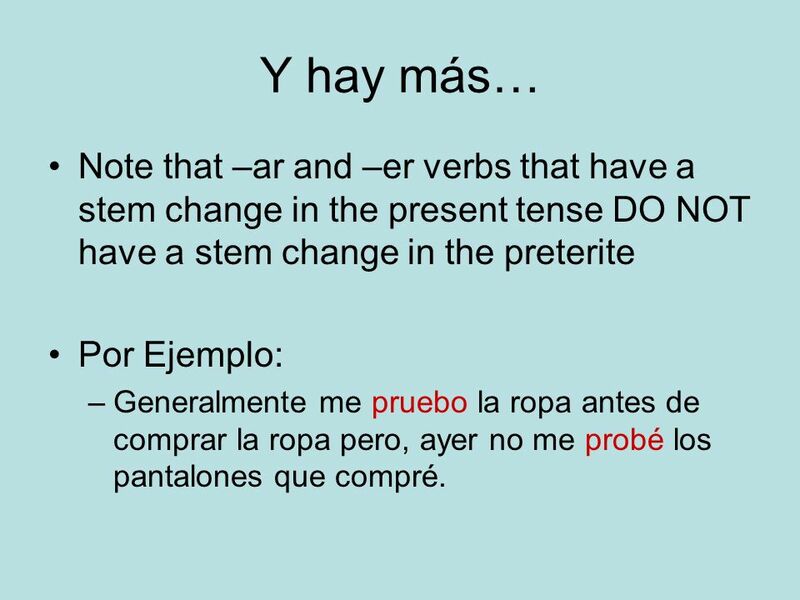 5 Y hay más… Note that –ar and –er verbs that have a stem change in the present tense DO NOT have a stem change in the preterite Por Ejemplo: –Generalmente me pruebo la ropa antes de comprar la ropa pero, ayer no me probé los pantalones que compré. 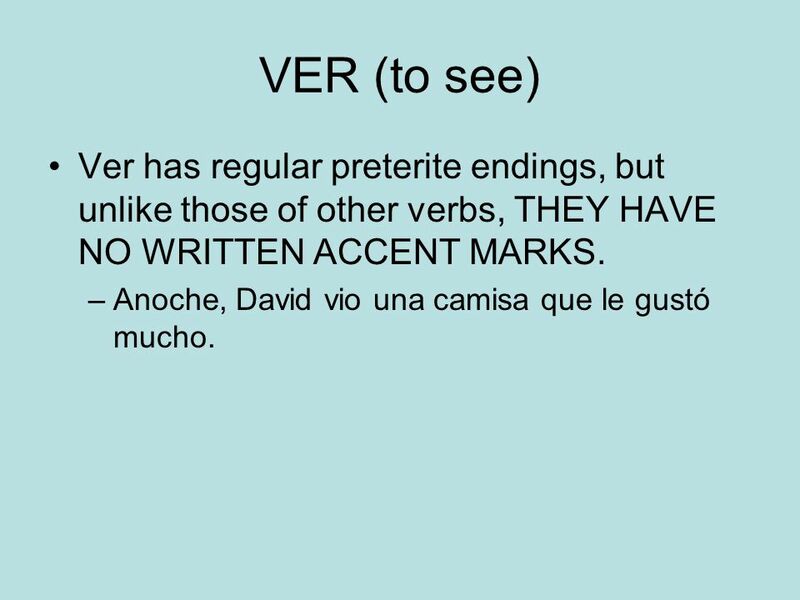 7 VER (to see) Ver has regular preterite endings, but unlike those of other verbs, THEY HAVE NO WRITTEN ACCENT MARKS. –Anoche, David vio una camisa que le gustó mucho. 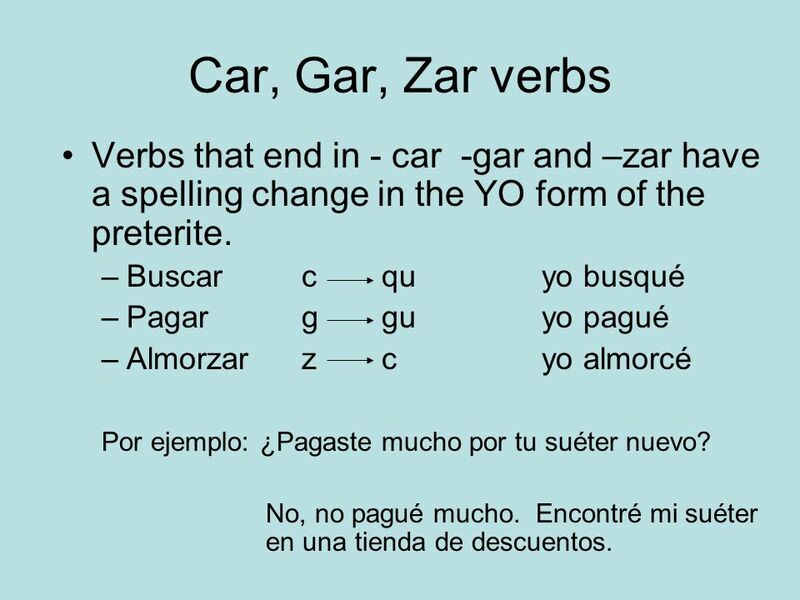 8 Car, Gar, Zar verbs Verbs that end in - car -gar and –zar have a spelling change in the YO form of the preterite. –Buscarcquyo busqué –Pagargguyo pagué –Almorzarzcyo almorcé Por ejemplo: ¿Pagaste mucho por tu suéter nuevo? No, no pagué mucho. Encontré mi suéter en una tienda de descuentos. Descargar ppt "El Preterito The past tense (#1). ¿Qué significa Preterito? 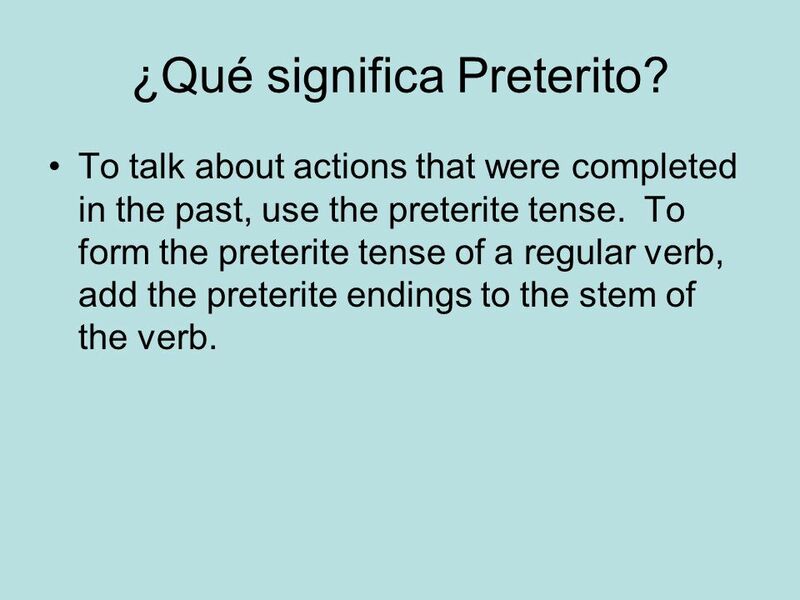 To talk about actions that were completed in the past, use the preterite tense. To form the." El pretérito: verbos en -AR What is el pretérito? Stuff that happened in the past!! Its DONE… OVER WITH!! 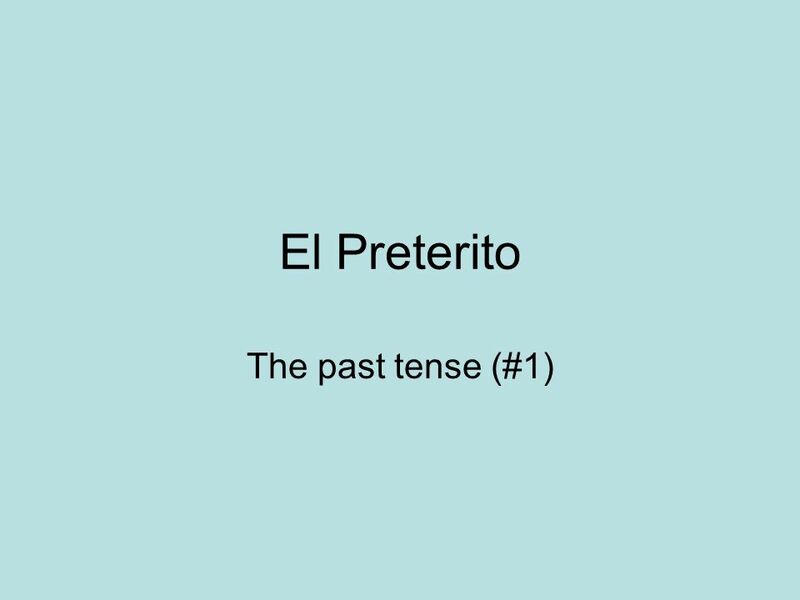 ANTE TODO In order to talk about events in the past, Spanish uses two simple tenses: the preterite and the imperfect. The preterite tense is used to express. 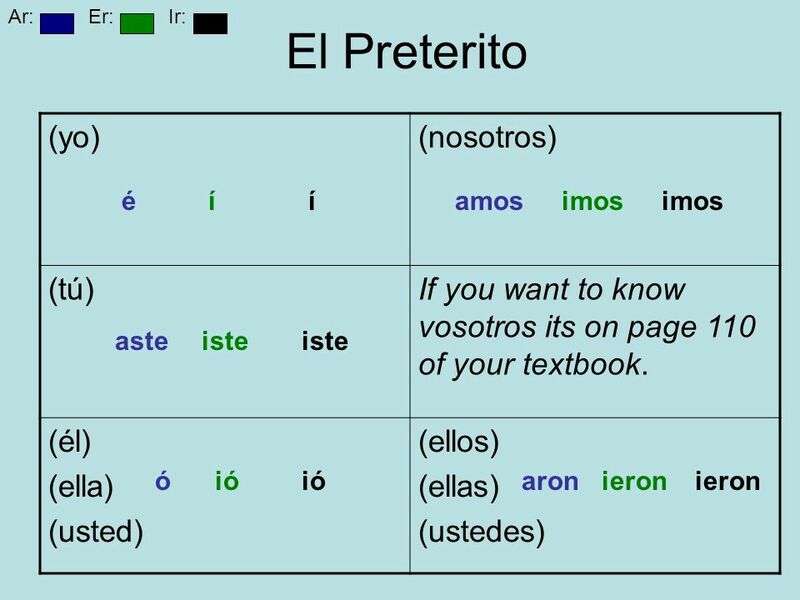 The Preterite tense What is the preterite tense in Spanish? An action completed ONCE in the past ONE SHOT DEAL Something that is started and finished.